After the atypical birthday celebration we had on our actual DAY... Bruce and I fell into the purchase of a present-to-ourselves... We set out to get the router needed to install the Rogue Wave Wifi booster I had previously purchased... and in shopping at Best Buy, long story short, ended up with a MacBook Air! So, we dragged our purchases back to our lair and set about the installation of the Wifi Booster so that we could (hopefully) get wifi in remote anchorages on our new boat computer. Should there be any followers who might remember another post on the subject of buying a boat computer... well, we ended up returning that one. It didn't work out... But we now have this lovely new Mac. I had done some Internet research and had also spoken personally to the IT guys who do our office computer work. I had some reservations about how a PC would fare on the high seas. Evidently the hard drive can be damaged by extreme vibration and the Mac, having no moving parts, I hope will do better. I guess this will remain to be seen. But for now, we're movin' in. So, back to the installation... Bruce took our stateroom apart. We discussed our strategy and settled upon using the 110V power source on his side of the bed. The Rogue and the router both have 12v options and we considered running a 12v power source to the back of the boat where the Rogue will come through the deck. But I deferred to Bruce and his choice was to use the existing 110v source. We had plenty of cable to use so that was our plan. We can always change it later if it becomes inconvenient. We fully anticipated the need for drilling one or more holes in the boat. We pulled out the drawers and removed the settee cushions in search of the perfect path to run the cable. 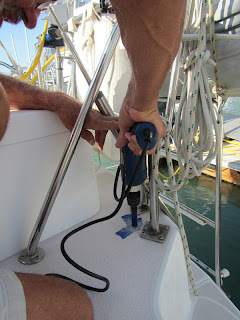 In the end, with my smaller hands and Bruce's long fingers... we found a way to coax the cable up through an existing opening and ran it through the AC duct holes all the way to the stern. YAY! No new holes! What's taking so long...? Why does it look like there are shiny metal shavings coming out of the hole? and WHAT is that SMELL?!! Bruce pulled the bit out and tried to dig the stuff out of the bore. It looks like the bit is broken. NOW What!? We looked down into the gaping hole and found daylight where pilot bit went through... but... there is a shiny metal plate that wasn't budging. So we found stainless steel! 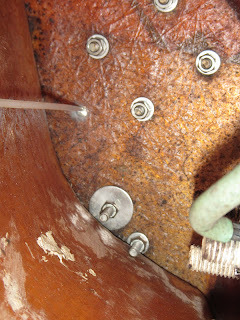 We stuck a long bundle tie through the hole and went below to look check our position from below. No sign of a stainless plate could be seen... it was glassed into the deck to provide support for the hardware that attaches the dinghy davits to the stern and deck. We are glad to know that our boat is built so solidly, but what do we do now! Well, we need another drill bit. We will have to put the project on hold until after the Harvest Moon Regatta. Insert waiting music here and fast forward to Sunday, October 28th. Harvest Moon Regatta is over, Bruce is back and we're going to finish this up before we take the boat for a haul-out. Bruce finds a nice 3/4 in. bit that will drill through stainless steel and we're all set. Once again I dance around on the deck while Bruce puts the drill bit to work. I watched as a mountain of metal shavings piled up outside the hole. Will it ever bore through? YES ! Finally! The bit did it's job and I now have a very big hole in the deck. I cleaned up the metal mess and went to work installing the through-deck piece we bought. We used Life Seal to keep the water out and it was a bit messy. I got it all tidied up and it looked nice. Now for the backing below decks and I'm done. Well, that's where I ran into a snag. 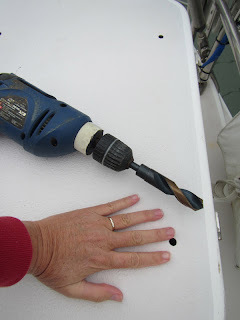 Long story short, there is a lazarette on deck that ran too close to our hole for us to screw on the backing nut. So we ended up just leaving it for now and will figure out a way to secure the piece when things settle down. But!... the Rogue works and we're one step closer to making our sailboat a home.